Where does inspiration come from? When it comes to fashion, when it comes to designers, we all know that inspiration can be drawn from just about anywhere. I am always intrigued by where inspiration comes from; it seems so unique and provides such a profound insight into the designer. A little while back I spoke with Rebecca Robinson, the designer and founder of psnob. The idea behind her amazing clutches is turning fine art into a functional purse. As I spoke with Rebecca, I could hear her passion, her love, and her dedication to these handbags. With a background in photography, fine art, printmaking and graphic design, it is no real shock that these handbags show amazing attention to detail. When using acrylics on cotton canvas to make the clutches, Rebecca went through a lot of trial and error. She said that she has spent much time perfecting her technique in order to make sure the color doesn’t bleed, crack, or fade. Yet, all the hours that went into creating these pieces of art made into handbags was worth it. The end result isn’t just a clutch. It is a piece of art. Imagine carrying one of these as you head out. I imagine countless people stopping and inquiring about what I was carrying. 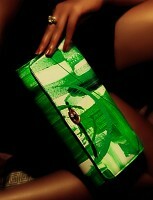 The clutches are fabulous and we are more than extactic that we get to share them with you. Make sure to take a look at other options by clicking here.